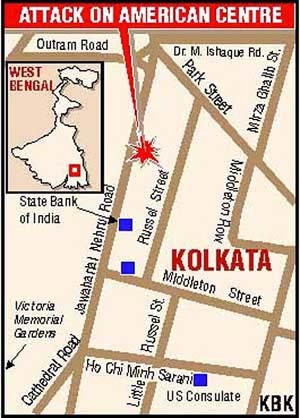 In a daring shoot-out in front of the US Information Center in the Chowringhee area today terrorists carrying AK-47 rifles killed five policemen on duty, and injured 20 others, some of them seriously. This was the first such terrorist attack in the country after the December 13 attack on Parliament on a day, which interestingly coincided with the visit of the US FBI chief, Mr Robert S. Muller, in New Delhi to discuss with the Indian officials the strategy to be taken jointly against terrorism. So far two different terrorists groups have claimed their involvement in the action that obviously was targeted at the USA and these are Harkat-ul-e-Jehadi and Asik-Raja Commando, both having links with Al-Qaida and Lashkar-e-Toiba. After the incident a red alert has been sounded all over the state and the neighbouring states. Security measures have been tightened in all foreign embassies and consulates, government offices and other vital installations in and around the city. Security steps have also been beefed up at the US Embassies and consulates in the other states. 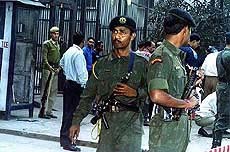 Commandos stand guard at the gates of the American Center in Kolkata on Tuesday after the shoot-out. Chief Minister Buddhadev Bhattacharjee apprised the Union Minister, Mr L.K. Advani in the morning on telephone of today’s attack. 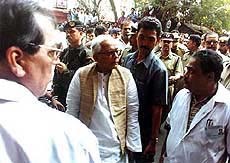 Expressing deep concern over the incident, Mr Advani said he would soon send a senior Home Department official to Kolkata to make an on-the-spot study of the incident and suggest preventive steps. According to an eye witness account, around 6.30 am four terrorists came on motor cycles near the Information Center on the Jawaharlal Nehru Road when the change of guard was taking place. Two of the terrorists got down and started firing indiscriminately at the constables, taking them by surprise. According to another version only two terrorists on a motor cycle went on a rampage, killing the constables. A third witness said he had seen one Ambassador car speeding away from the spot after the incident. The Chief Minister however, said nothing about the incident or the terrorist group which was behind the incident. But he admitted the terrorists carried AK-47 rifles from where over 50 rounds had been fired. He said two different terrorist groups had claimed their roles in the incident. He, however, asked the police to inquire into it. Four constables who died on the spot were identified as Pijush Sarker, Ujjal Burman, Suresh Hembram and Anup Mondal, all in the age group of 22 to 28 years. The fifth person died in the hospital and was yet to be identified. All four belonged to the fifth battalion of the Kolkata armed police. A police van parked at the gates of the US center averted a higher number of casualties even as the police were caught off-guard by the terrorist attack. The van, brought in to drive home policemen on guard at the center after the end of the duty hours, stood in the way of the line of fire, thereby saving the lives of a number of policemen. There were 64 policemen at the center. Thirty two policemen are on duty in each shift. Immediately after the terrorist attack on the US center an anonymous caller threatened to blow up the state BJP office “anytime’’. “After the American Center now it is your turn. Be prepared for the worst,’’ said the caller when he rang up the state BJP office secretary Sailen Majumdar twice — first at 7.10 a.m. and then again an hour later. State BJP Vice-President Muzaffar Khan said there were two calls, one in Bengali and the other in Hindi. The caller, however, refused to identify himself. Ironically, it was the caller who had first informed the state BJP secretariat about the attack on the American Center. Meanwhile, Mr Advani spoke to US Ambassador Robert Blackwill and reaffirmed their commitment to cooperation between the two countries to prevent terrorism following today’s attack, a statement issued by the US Consulate-General here said. The US Information Center would remain closed during the day, the statement said. ISLAMABAD: Pakistan has condemned the attack and rejected the Indian allegations that its intelligence service was involved in the attack on US Information Center. “These are totally baseless charges. As you know, Pakistan has condemned terrorism in all its forms and manifestations,’’ Foreign Ministry spokesman Aziz Ahmed Khan told a news briefing. The shoot-out incident outside the US centre in Kolkata carried out apparently by the outfit of Dubai-based mafia don Aftab, alias Farhan Malik, is clearly indicative of some of the Pakistani supported groups targeting India through other countries, Home Ministry sources said here today. The involvement of Malik, who is living in Dubai with a Pakistani passport and a frequent visitor to Pakistan, also proves the Indian assessment that Islamabad continues to use criminal/fundamentalist groups for perpetrating terrorism against India.